Long before there was a Grand Torino, or Shelby Cobra, there was this Turin Ford. That's an early-1950s roadster built in the Northern Italian city, using a Ford V8, custom tubular frame and a body by a local firm. 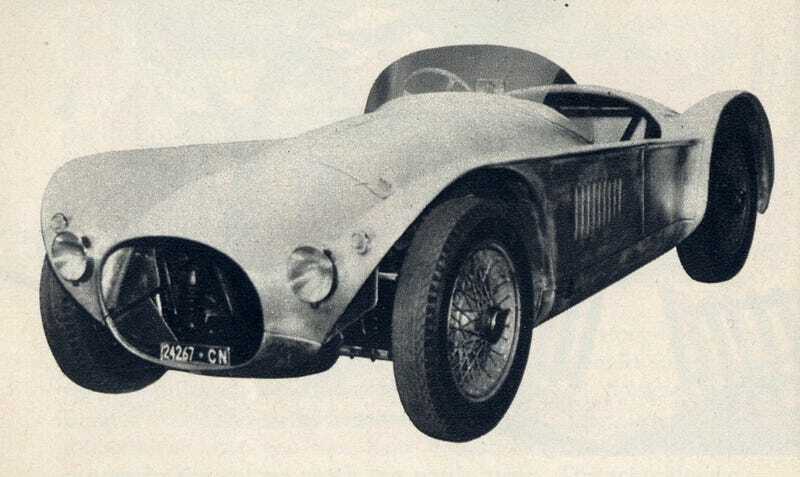 Hemmings found the roadster in an old copy of Ford Times, the former company magazine. The Turin Ford's the product of an uncle and nephew team, Paolo Cordero di Montezemolo (perhaps a distant, aristocratic cousin of Ferrari chairman Luca?) and Beneventani Marco, of (you guessed it) Turin, Italy. The two reworked the engine to displace four liters, added four carburetors, overhead valves, and 8:1 heads. The resulting power totaled 180hp at 4,000 rpm and a top speed of 130 mph. Guess Cordero di Montezemolo needed a daily driver to complement his weekend car.